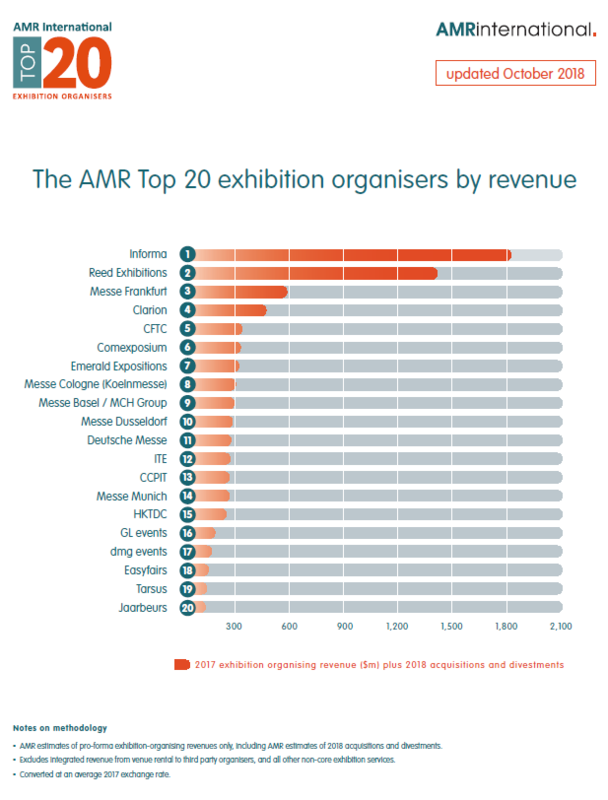 Leading advisers to the global events industry, AMR International has today released its annual “Top 20 exhibition organisers” the only global ranking based exclusively on exhibition organising revenue. The ranking takes into account 2017 revenues and 2018 M&A activity to date. The top spots have substantially changed since the previous AMR Top 20 was issued in mid-2017. Informa now tops the table, with Reed Exhibitions in second spot and Messe Frankfurt completing the podium. Many position changes through the table are linked to the biennial cycle of the German Messen’s activity. New entrants Tarsus and Jaarbeurs benefit from the disappearance from the table of UBM (acquired by Informa) and Ascential (who sold its pure exhibitions business to ITE). The AMR Top 20 enables exhibition organisers to easily see how they rank in the global events market. It also helps organisers to track any shifts in market share, particularly ahead of the financial reporting cycle. In addition, the ranking presents an alternative view of the industry, isolating exhibition organiser revenues from venue rental and service revenues. Organisers are ranked on the latest fully reported year combined with pro-forma revenues of acquisitions. Meanwhile, more in-depth analysis on the global exhibitions industry will be available from November 2018 when AMR releases the 10th edition of Globex: the global exhibitions organising market: assessment and forecast to 2022. For over 25 years, AMR International has developed unparalleled experience in the events industry. Today, as the events industry accelerates along its evolutionary path, AMR’s mission is to act as a guide for organisations seeking to navigate this change. AMR supports all facets of strategy, event lifecycle, data and digital, operational and transaction support. AMR is also a regular advisor to financial investors in the events industry, providing strategic M&A support in emerging and mature markets. AMR has offices in London, New York, Paris and New Delhi, as well as on-the-ground experience in more than 30 countries.